Your Chance to Get NEW Mini Designs First! 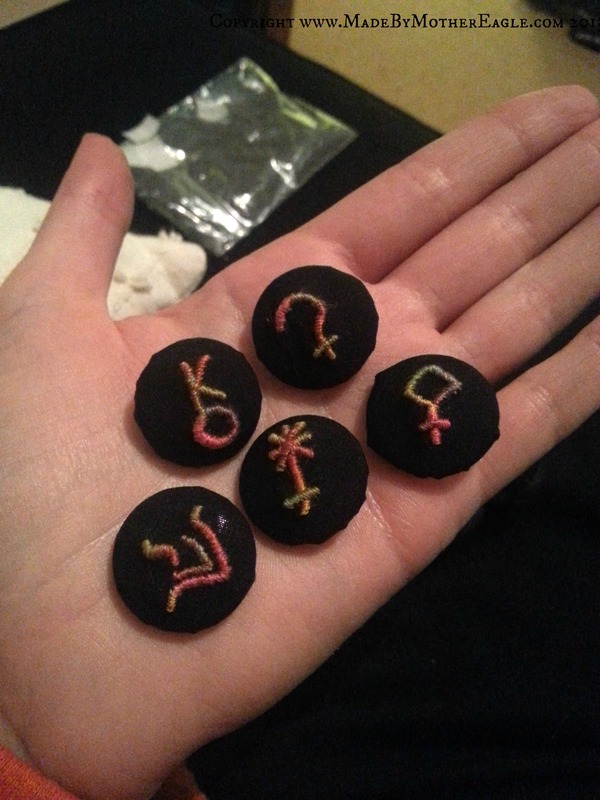 Here are the new 23mm set of 5 covered buttons, a set I call ‘Astral Bodies’ and each bears a cosmic symbol in rainbow couched variegated cotton. Ceres: The largest asteroid and the only dwarf ice-planet in the inner Solar System, orbitting between Mars and Jupiter. In ancient Roman religion, Ceres was a goddess of agriculture, grain crops, fertility and motherly relationships. Pallas: The second asteroid to have been discovered (after Ceres), and one of the largest in the Solar System. In Greek mythology, Pallas was one of the Gigantesses born of the blood which spilled onto Gaia when Cronus castrated his father Uranus. Juno: The third asteroid to be discovered and is one of the larger main-belt asteroids. In Roman mythology Juno is a daughter of Saturn and sister (but also the wife) of the chief god Jupiter and the mother of Mars and Vulcan. Juno is the Queen of the Gods. Vesta: The second-most-massive asteroid after the dwarf planet Ceres. Vesta is the virgin goddess of the hearth, home, and family in Roman religion. Vesta’s presence is symbolized by the sacred fire that burned at her hearth and temples. Chiron: A ‘hidden Moon’ of Saturn. In Greek mythology, Chiron was held to be the superlative centaur among his brethren. Now for the exciting bit: Head over to my Facebook page (and like it if you haven’t) where you will find details of how you can claim this set, or any of my other mini buttons for a special one-time-only price! What Is Smaller Than A Mother Eagle Minature Embroidery?